There are dozens of gondolas in the US that were not built in Venice. Many are easily recognized as such if you know a thing or two about gondolas. Most have some sort of obvious design feature which differs from a Venice-built boat, and in many cases it's there for a reason. Some gondolas in America have canopies for weather related reasons. 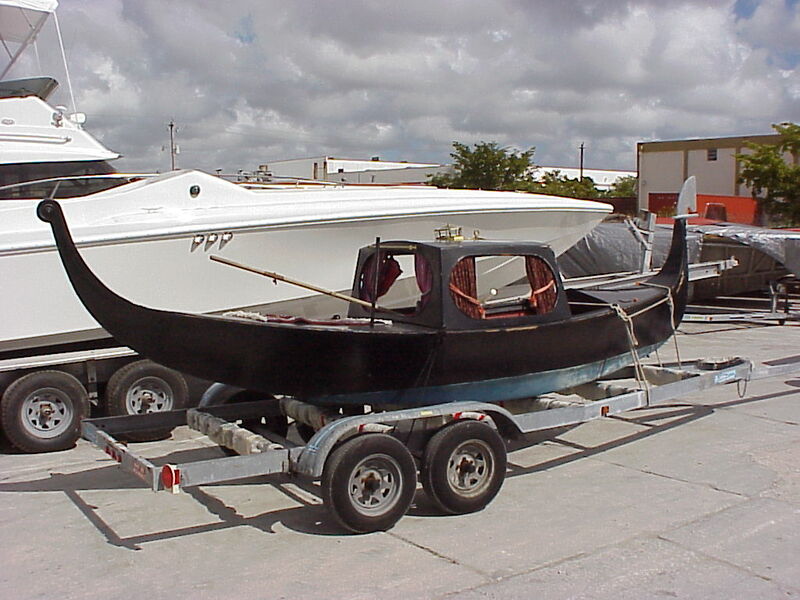 Some American versions have a propulsion system in order to operate on rivers or in heavy wind and currents. Still others are of a non-regulation size. Today we are looking at a little boat that has all of these traits. This vessel, like so many others, has an unclear history - not much is known about her origins. At this point I don't think anyone knows. Those who knew have now passed away. At the top of that list, of course, is the late Karl Ruhnke - a friend and fellow gondola fanatic. She was in Karl's fleet for many years. 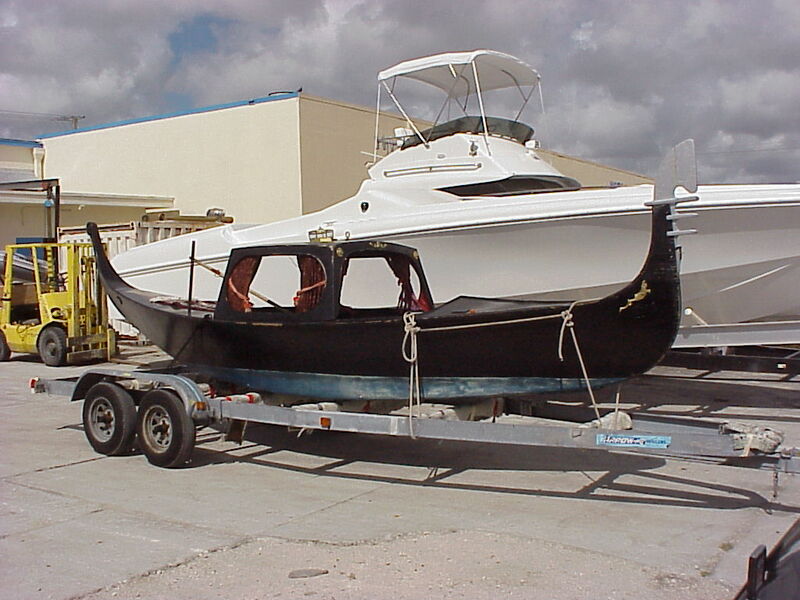 He trailered her to several ports in Florida. I saw her once while visiting him at his home base in Miami in 2000. I'm told she was built in or around Florida. Her appearances in news clippings attest to her presence in the Sunshine State as early as 1984. Yes, in fact Karl told me that she was only 22 feet long. She looked even shorter in the water. At the time, she was the shortest gondola anywhere. Karl and his staff referred to her as "Senora Minni B" or simply "Mini" - a fitting name for a boat of such dimensions. This was probably a big plus during those tropic sprinkles (and downpours) that are common in Florida. "Steering? Rowing? What the heck is that?" Karl once told me that she had a "Polish forcola". This was fifteen years ago and Karl was a bit more old school than I was. Funny how derisive slurs about Polish people and things aren't, well, funny anymore. I never actually drove the boat, but I know that she had a 12 volt electric motor and the oar was used for steering (not sure if anyone in Poland ever used such a system). The boat had so many unique details. On top of the canopy there was a brass lamp. The tail had a distinctive shape. And while the ferro wasn't true to Venetian form, it was clever and unusual. Last I heard, this boat was sold to someone in the upper Mid-West. I don't know if she's still afloat, but if she is, I'm sure she's turning heads. The boat was unusual and memorable, just like Karl. I saw gondolier Karl Ruhnke in Miami, had a wild tour of the city in his Corvette which included Cuban Coffee (espresso with cane sugar), two gondolas, the Versace home, Gloria Estefan's night club, a few very seedy ship yards and a dinner of fish & chips with hush puppies. At one of the shipyards I saw a houseboat which had been hoisted up and placed on top of a building to create a second story. And then there was this white guy with bad teeth who everybody was calling "Black Dog". After hunching over the back end of Karl's Corvette sniffing and listening to the exhaust pipe for no less than five minutes he told Karl with a strange smile that his engine tuning was "just right". I decided that this guy was either one of those REALLY good mechanics or a practitioner of some strange automotive voodoo. Either way - I tend to avoid questioning the methods of people with names like "Black Dog". We also encountered a few raised bridges, boats seized by the DEA and some kind of freaky free-range "Santeria Chickens" which ran wildly across the road in front of the car. The whole tour lasted about three hours and broke the speed limit, parking laws and probably other regulations as well. He was a perfect, textbook example of how "gondoliers are interesting". and wherever you are, let's all raise a toast to Karl Ruhnke! Cute boat, but what about its carrying capacity? How do the polish make tomato soup? Boil hot water and pour it in red dishware. She had two seats, facing each other - similar to a horse-drawn carriage. Typically she could carry four passengers, but if they were thin enough, I suppose they could sit three across - allowing for six passengers. My guess is that the "Mini" took mostly two passengers at a time. Hello 'Gondola Greg'. I was searching for Karl. I wonder if you are talking about the same Karl I knew - and loved. Are you referring to a very tall, very white skin, light-blue-eyed guy who was very funny and talkative? My name is Gabriela. Please let me know. Thank you!